Pleasantville Police Capt. Rocky Melendez speaks to a reporter near the Spinelli mausoleum at Greenwood Cemetery in Pleasantville. Pauline Spinelli's body was stolen last week. Signs of forced entry are seen at the Spinelli mausoleum at Greenwood Cemetery in Pleasantville. Pleasantville Police Capt. Rocky Melendez speaks near the Spinelli mausoleum at Greenwood Cemetery. Greenwood Cemetery workers found the door of the Spinelli family mausoleum broken and the casket opened Friday morning, according to Capt. Rocky Melendez. Signs of forced entry are seen at the Spinelli mausoleum at Greenwood Cemetery. PLEASANTVILLE — A corpse buried in 1996 was stolen from a cemetery last week, police said Monday. Police have not ruled out the possibility that a cult might be involved. 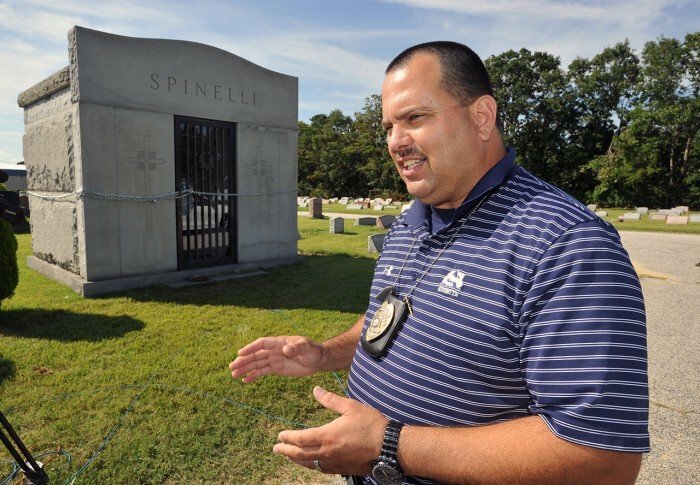 Greenwood Cemetery workers found the door of the Spinelli family mausoleum broken and the casket opened Friday morning and reported the incident to police, Capt. Rocky Melendez said. The remains were those of 98-year-old Pauline Spinelli who died in June 1996. Her remains were one of six kept in the Spinelli mausoleum. Cemetery personnel told police that when they groomed the grass on Thursday the mausoleum was intact. Metal bars on Monday still covered the glass door, which was broken, and the lock was still missing. The door is now held shut with a chain that wraps around the entire structure. The mausoleum is located in a back corner of the cemetery located on Washington Avenue. Melendez said that they are still investigating the possibility that the remains may have had value to a cult group. He said that research indicates that towns in northern New Jersey have experienced similar incidents. Melendez said he believes here was more than one person involved. A large pointed rock was found on the ground outside of the mausoleum. Melendez said it could have been the tool used to break the window. 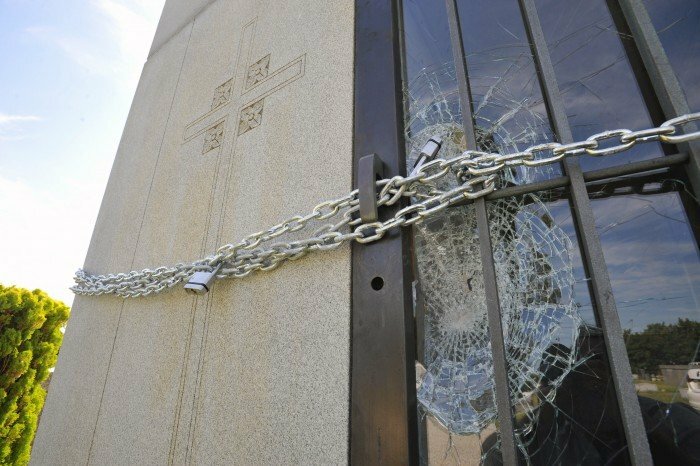 He said a hammer may have been used to break the glass. The cemetery does not hold a key to the actual mausoleum. Only the family holds a key, Melendez said. Melendez called the incident disconcerting. Cemetery officials had no comment. A woman who has stolen nearly $3,000 worth of Wawa coffee over the past year may be losing sleep at night. Police are looking for a woman who allegedly has stolen more than $3,000 in coffee from WaWa across three states.